The manual transaxle has five forward gears. Press the clutch pedal down fully while shifting, then release it slowly. A special safety feature prevents inadvertent shifting from 5 (Fifth) to R (Reverse). 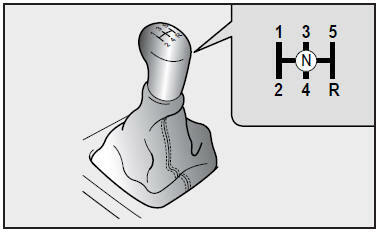 The gearshift lever must be returned to the neutral position before shifting into R (Reverse). To avoid premature clutch wear and damage, do not drive with your foot resting on the clutch pedal. Also, don’t use the clutch to hold the vehicle stopped on an upgrade, while waiting for a traffic light, etc. Before leaving the driver’s seat, always set the parking brake fully and shut the engine off. Then make sure the transaxle is shifted into 1st gear. Unexpected and sudden vehicle movement can occur if these precautions are not followed in the order identified.